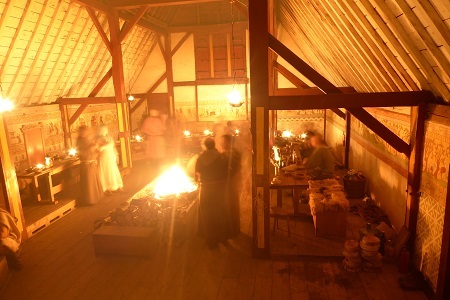 For many years Regia Anglorum nurtured a desire to have their very own longhall – a place its members could call their own – a place to ply their craft in sympathetic surroundings – a place to retire to when the call for re-enactors diminished; a Lord of the Rings-style “Grey Havens” for the membership, as it were. Fortunately, a succession of opportunities involving a music video, a longship and Blackpool leisure beach supplied the funds to buy some land from Wildwood Nature Park and set the society on the path to creating their dream. The ideas were simple, but the vision was grandiose. 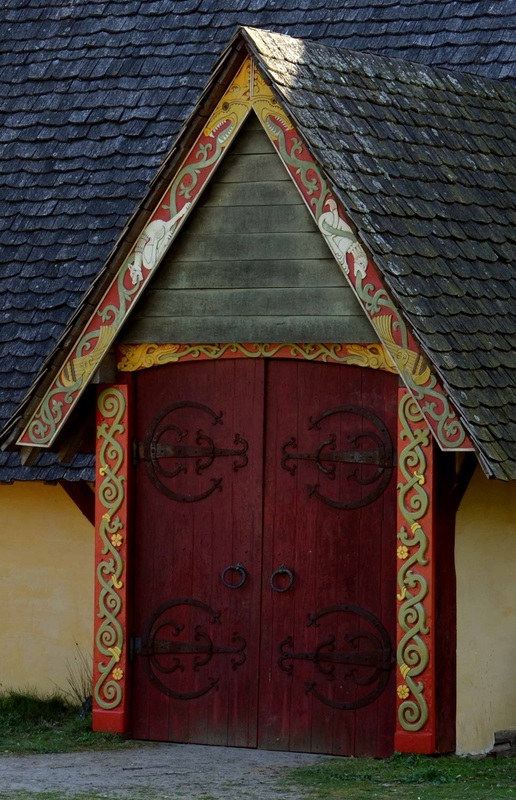 As can be seen from the pictures, it was decided that the first building to be constructed would be the longhall. It was, by its very nature, the biggest and most technically challenging project. But it was felt that if we didn’t tackle it straight away, we would never get around to building it! That said, however, to whet peoples appetite, a small thatched cottage was quickly constructed near the entrance. And so, with the land purchase complete, the site was cleared by a third party, using industrial plant. Pine trees were felled with a measured contempt and removed for us. 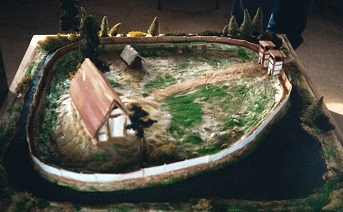 The majority of tree stumps were dug out and a defensive enclosure was built in the form of a moat and embankment. Oak was purchased from the local area, made cheap due to the recent storms, and from the works arising from the Channel Tunnel rail link. And as such, the first workers who arrived on site, were provided with a blank canvas to work from, and some huge pieces of tree to work with! By the end of the year, the central aisle of this 4 bay, 60ft long, 30ft high structure was erected. It was comprised of fifteen 11 inch square pieces of Oak. Working the wood “green” made the job a lot easier than it could have been, but the tannin stained not only the wood, but also the tools we were using. In might be prudent to note here, that we have always claimed we are not, in any way shape or form, re-enacting the building of a longhall. We have neither the time, skill or manpower to get the job done. Perhaps when the project loses its urgency, we can attempt the use of traditional techniques in building a structure, but until that day, we shall worship the gods, Bosch, DeWalt and Axminster*. Back to the task at hand; instead of a trench-and-post structure, a single pit was dug for each post, and the post itself anointed with bitumen before being permanently installed. 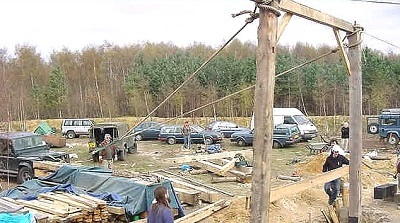 The four, large, goal-post-like structures were pulled into place using a land-rover winch. Such was our immediate affection with the site, wildflower grass seed was optimistically sown in various areas, and we even did a show in June. Blisteringly hot it was. “Vikings on Mars” it was dubbed – but we ferried the eager public in through Wildwood’s gates, who were understandably curious to see what all the fuss was going about. Elsewhere, within the confines of Wildwood, a Sunken-Featured Building (SFB) was constructed. It served as not only a device to occupy an excess of eager volunteers, but also to promote the longhall, near the unsuspecting visitors to the nature park. As work withdrew into Wychurst, it would eventually crumble away. Valuable lessons were learned; such as where not to build a SFB. The land in that part of the world is a mixture of clay and lenses of silt. This meant that water would trickle down the “soil” and through the unprepared walls, into any hole that presented itself. The outer aisles to the longhall were the priority for this year. Cross bracings were “lapped” from the main upright, through the cross beam down into the outer wall’s uprights – and so they were all tied together, creating a solid framework. Building control had slightly different ideas however, and insisted on steel bolts to secure all the pieces to each other. 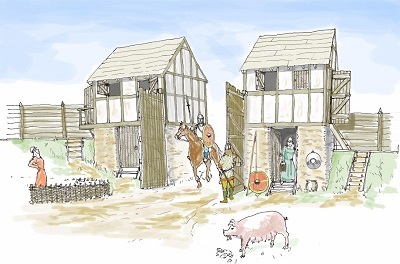 Extra manpower was diverted to first of two flint-walled gatehouses that were part of the original design and work started on what was described at the time as the Tool shed / Stable project. Supplementing a small patch around the original cottage, a garden was also created just inside the burgh, by the front gates, where various period plants were encouraged to grow. There were some outrageously large tree roots to get rid of first! Then came the rotovating, and the incorporation of as much organic material as we could get our hands on. Alas, our infrequent visits, more notably around springtime, proved to us that the best thing that grew at Wychurst, were the weeds! The spring was fine and clear – in fact, the weather in the eastern tip of Kent is generally very dry in summer and we have had to take steps in order to keep water in our lake all year round. During 2003, the main focus of our work was turned towards completing the roof structure. After considerable thought, we decided to construct the four sections on the ground and lift them into place with a specially hired in crane. 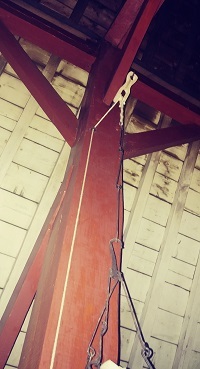 There was a great deal of repetitive, careful woodwork in order to create the top rafters, collar beams and the purlins that lock them all together. At every stage of design and construction, there was constant discussion about the best way to achieve our objective and the construction of the roof was an excellent case in point. 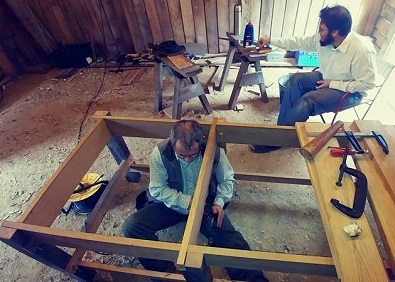 The chief designer, carpenter and marker-out, Kevin Cowley exhibited the patience of several Saints as every aspect of his design was examined, gnawed at and discussed. But he stuck to his guns over the roof structure and the A frame rafter sections were loosely assembled to the secondary aisle plates and then the clenched and trenched purlin, a solid piece of oak the length of the bay, three inches thick and eight inches deep, was driven into place with two twenty eight pound sledgehammers. These locked the whole thing solid and, when rapped with a knuckle, the completed section rang in a satisfying way. The ends of the main aisle plates were cut as simple half scarf joints, but the secondary aisle plates into which the upper rafters were fitted and the purlins which tie the whole upper roof structure into a solid whole demanded something more. They were cut into a joint that we nicknamed “dragon scarfs” and were designed to be double wedged to lock them together. It was a great tribute to our efforts to see these joints line up perfectly twenty-five feet up in the air and to draw the whole sixty feet of roof together in one unit as the matched sister wedges were driven into place. As the roof dries over the next ten years or so, they can be replaced with thicker ones to maintain the single integrity of the structure. In all, 194 pieces of oak needed to be sawn to length, jointed and fitted together and this took us most of the summer, culminating in the Lift Day when all our hard work was hauled into the air and slotted into place in a little under five hours! The next job was to extend these rafters to the top of the outer aisle plates to complete the roof. We designed an ingenious tool that was invaluable in measuring the length of these rafters, enabling a simple production line to be set up and by the end of the last work weekend of the year in mid-November, we had finished five eighths of the roof. It was completed over Easter 2004, almost two years to the day since we hauled the first bay into place with Dave Higginson’s Land Rover winch. 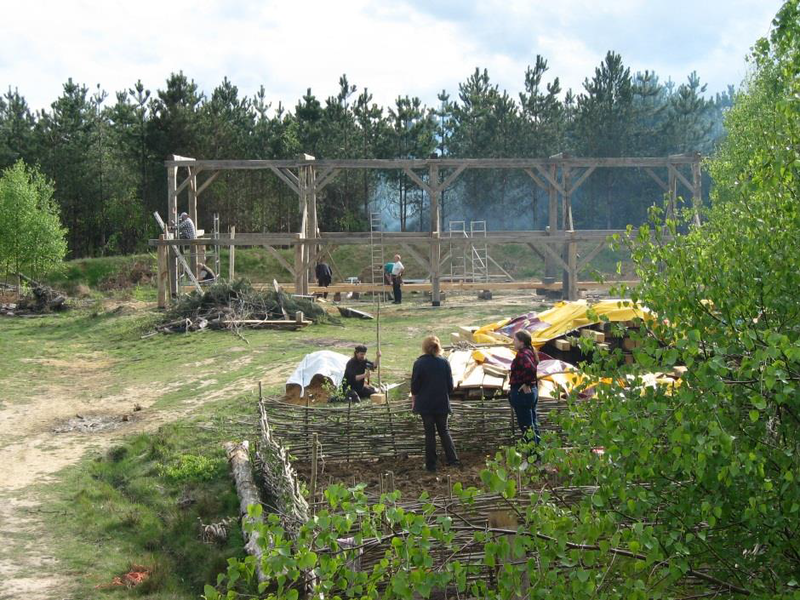 The main frame and roof structure were completed at Easter, just two years to the day since we erected the first bay main frame. We had a little “topping out” ceremony and you can see the holly wreath in place on the end of the gable. Work began on the palisade that surrounds the burgh. It would be a long arduous task, and it is commendable to the stalwart crew that they saw it to the bitter end. 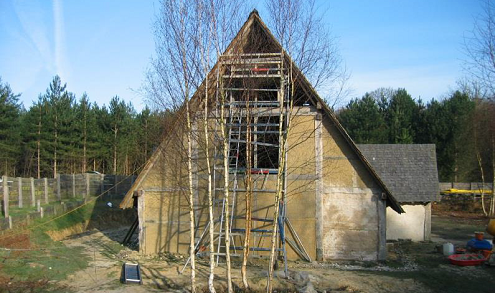 Our first Work Weekend in the year saw us consolidating our work and beginning the construction of the walls and the application of the sarking boards to the roof. 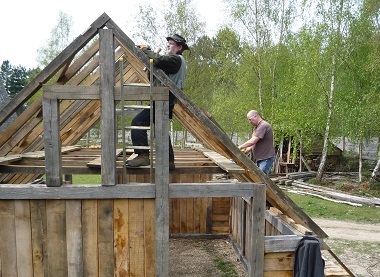 Although the roof sections were in place, much work remained to be done to complete the rafter work and try to halt the twisting of the most recalcitrant of the green oak rafters. After considerable discussion (not to say heated argument!) we fixed on a design of wall based upon a simple cill beam, two uprights dovetailed into both aisle plate and cill. The lower beam is simply pitched and earth-fast. We looked at various infill patterns and considered everything from the most modern and expedient, to obtaining a quote of over £10,000 to fill the walls with split hazel withy panels. 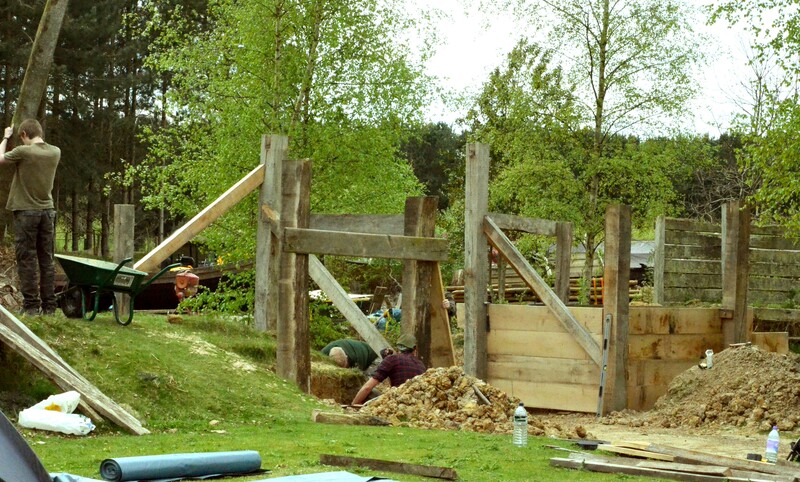 We finally decided on a system which appears to have been in use before, during and after our period, a number of rough, vertical oak lathes crossed both sides with battening, covered in daub and chinked through, both layers connecting through the chinking. We have thus used up a great deal of oak off-cuts that would have otherwise become firewood. One of our big problems as a commercial organisation is that we need to perform re-enactments for paying clients in order to raise the money to continue our work at Wychurst. Clever we might be, but even we cannot be in two places at once! The Work Weekends are booked a year in advance, but we occasionally change or cancel them should paid event work come in, it always taking precedence. 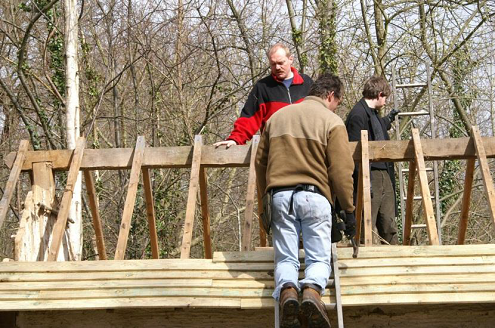 Our final task for the season was to erect the porch main timbers. This proved a lot more tedious than we imagined at the outset and required a good deal of lateral thinking to complete. 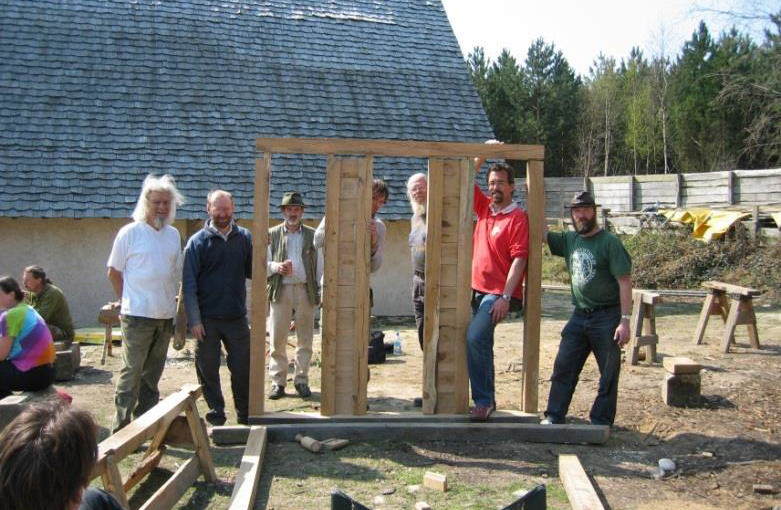 Eventually, after a few technical hurdles (such as cutting the timbers too short) we got it together as a separate structure standing very close to the Longhall! Whilst not yet complete, a magnificent carved lintel board was joined to the porch and will remain as an integral part of the structure. The most visually significant part of this year were the addition of shingles to the roof. For previously mentioned reasons, regarding time and resources, these were all shipped in. We needed quantities in the thousands, and having personally tried to split my own, I had no particular objection to this shortcut! All were oak, and were split rather than sawn. This was not only down to authenticity, but also to prolong their life expectancy. All were also “scalloped” so their bottom edge described part of an arc. Despite this complication of having to match “lefts” from “rights” we were half way up both sides by September. Back on the ground, the porch construction (front and rear) continued, along with the wattle and daubing. Lead flashing was used in the gullies as the ridge of the porches, to improve weather proofnesss. Meanwhile, the palisade reached three quarters around the perimeter of the burgh by the end of the work week. The front roof was completed and shingling advanced about a two thirds of the way up the back roof. The walls were completely in-filled, doors and hinges were fitted and our hall was secure for the first time. Work on the walls continued. 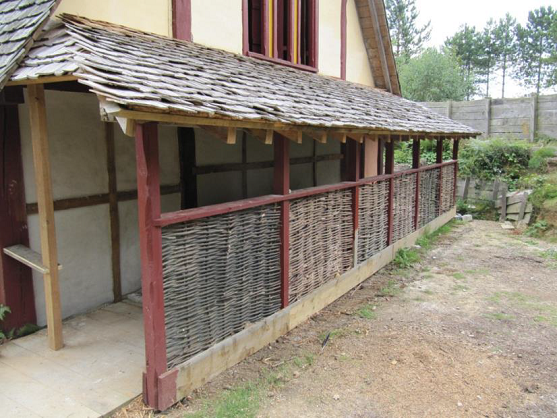 The nature of the wattle construction (or softwood “laths” in our case) would come back and bite us in the future, as the subsequent layers of plaster would make them over-thick. On the side walls this would pose little problem, as they were short, and under cover of the eaves. The end walls were a different matter, and they would protrude beyond the main beams, allowing water to penetrate the plaster and daub – and in winter, when it froze – the panels would separate and eventually fall off. It was decided at the time, that to be able to use hazel for the wattle, would have not only been exorbitantly expensive, but would have divested the southern half of England of it’s hazel crop. Allegedly. But not every poorly made decision we make is irreversible, as we eventually would figure a work-around. Work spread across the whole of the site as the palisade reaches the point at which it needs to be filled in. By September, there was a celebratory “topping out ceremony” as the shingling of the roof is complete and the boarding up of the gable ends began. As much for effect as for water resistance, all the planks were rebated, so that water couldn’t drip through and encourage rot. And the inner doors of the longhall were installed. Work on the walls continues. Once all the walls were daubed and dry, plastering inside the hall began in earnest. Three coats were required, a coarse base layer, a medium grain intermediate layer and a fine top layer. Due to the cost of the materials, this was one of those jobs that benefited from being done by someone who already knew what they were doing, rather than by experimentation. But once the first coat went on, others received tuition, if not to help broaden the labour pool, but to give the poor plasterer a break! 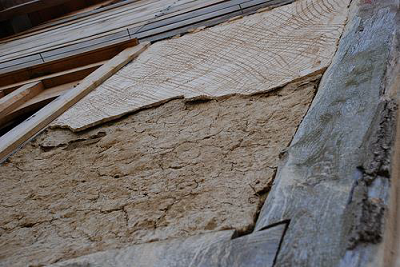 Lime plaster is also somewhat caustic, so care was required in its handling and protective clothing was recommended. So while the children could happily play with poo and mud and help daub the walls they were denied the somewhat strenuous pleasure of plastering. Wychurst drains poorly at the best of times, with the site primarily being made up of clay and silt. So, drainage works began around the site, with gravel filled ditches inserted through the burgh and around the longhall. Both of these drained out into the moat and provided immediate relief to short term downpours. The window frames at the top of the gable ends were installed. In time they would be screened off, but this task was at the bottom of a very long list of things, and it would be years before any attempt would take place. With the site slowly becoming clearer and safer, “shows” became ever more regular. 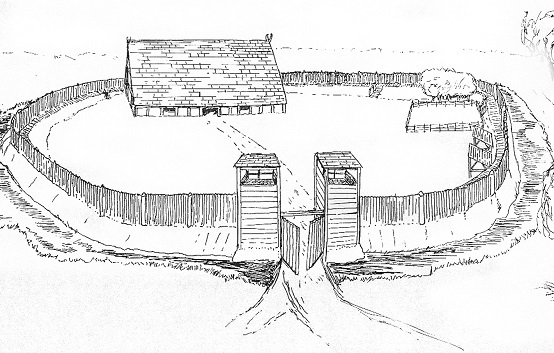 With the current Co-ordinator being of an equine persuasion, there was an identified need for some Stables on site, so construction started up against the palisade on the northern aspect of the burgh. An open sided structure, this went up quickly and easily. Regia is not entirely a law unto its own. We are still beholden to Planning Permission guidelines and Building Regulations. The latter part of these issues meant that we had to widen the gateway to allow fire engines closer access to the longhall, in case of emergencies. Therefore the entire main entranceway to the site had to be widened as part of the requirements for building control sign-off. This did allow us to redesign and rebuild the original tower which had been partially built for some time, but lacking a few elements that the foreman decided were important. So down came one, and up went two. 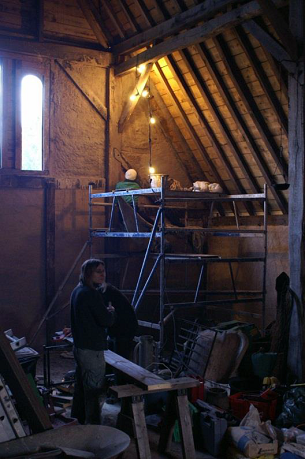 Back in the longhall, installation of the window frames started and the Lord’s Throne was constructed – partly because of some planned film work, partly as it was part of the required fixtures and fittings of the longhall. We always knew that the site would require maintenance, but we’d always hoped that it would happen “later”. Unfortunately this was the year it decided to happen. The first plaster panel had to be repaired. Fortunately it was only one, and it was dealt with swiftly. An attempt at thatching the Cottage barely survived a winter or two, so it was decided to turn what was effectively a storage shed into a water-tight storage shed (storage always being an issue for any on-going project). Feather board was used. It wasn’t the ideal solution (which was to thatch it properly) but as a structure it always had “issues”. Originally, the cottage was hastily constructed for some filmwork (a common occurrence in the early days of the project) and will eventually need to be deconstructed and “reimagined”. Until then it would remain a trifle anachronistic. Now, however, it was somewhat more anachronistic than we would have liked, but at least it keeps things dry. Following on from the previous year’s work on the gateway, this year in order to gain signoff for the work currently complete, widening of the causeway into the burgh began. This would cause a major headache in designing gates for the palisade, but that aneurism was a few years away. Other adaptations for building regulation compliance were the tearing out of the porch threshold and re-laying it so that it complied with the Disability Discrimination Act regulations. Time, Planning Permission and Building Regulations had moved on since the project was started and this was coming back to bite us in the proverbial posterior. However, slightly more in keeping with the spirit of the project, the longhall gained some shutters and a “practise” fresco panel was started. And elsewhere in the hall, the woodwork was given a lick of authentically manufactured gesso and paint. Big things on site this year, with the creation of the fire lake and a turning head laid in the middle of the burgh – the lake was required by the insurers, the second was required by Building Control. Neither were particularly what we had in mind at the start of the project, or indeed what we desired to spend a year doing, but it was something we couldn’t avoid. Additionally, during summer work week, a road was constructed around the perimeter of the burgh to allow for the deposition of Regia’s fleet, thus saving a considerable number of pennies in mooring fees. In time, perhaps, the turning head will grass over, and the gravel become less skiddish, but at least it gives us somewhere to park our cars (and boats!) on occasion. The fire lake will eventually have plants growing around the edge, and the chickenwire fence will be obscured with a dead hedge. With the plastering continuing in the longhall, minor modifications to the rear gateway were made and repairs to the roads around the site were completed during the work week. We also said goodbye to the garden. Having been a source of diversion for nearly a decade, it never really amounted to anything that anyone could be proud of, so infrequently was it attended to. So it was rotavated, levelled and grassed over. Sadly, the stables didn’t work as well as had hoped, with the horses that were stabled there preferring to be outside rather than in. 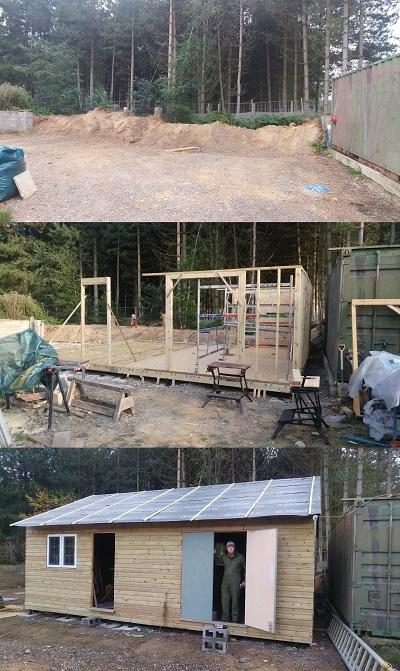 And so its conversion into wood store began with the gradient of the roof increased, bearers for the wood created, additional strengthening timbers installed and a feather-board roof (another compromise) put on. After years of circular debates and meetings, we also gained a shipping container to hold the huge quantity of “stuff” acquired over the years. Something had to be done as we were running out of places to put things, and if we were going to make regular use of the site, it all had to be hidden out of the way! Towards the end of the year, the foundation for the forge was dug out and filled with gravel and the start of Fresco “proper” began. Finally, rounding off the year we received the wonderful news that we Building Control had signed the Regularisation Certificate. And so, with a clear conscience, we could continue with the rest of our project. The singular and not insubstantial milestone for 2010 was the creation of the wooden floor! This was one of those occasions where a modern solution was needed to reduce the risk of rot. Gaps around the side were included to allow as much air as possible to circulate under the floor, as stagnant air is one cause of dry rot. So, taking most of the year to achieve, by hand and micro digger, we dug down eleven inches and created a series of raised brick walls and joists upon which the floorboards were nailed. This simple enhancement pretty much lifted the entire status of the hall from being somewhat akin to a barn, to that of somewhere you could call home! Outside of this development more drainage works occurred around the site, the construction of front doors began and their hinges arrived. During the floor construction the ever-present issue of dampness in the hall was deliberated over. The French Drain passed through lenses of silt that naturally occur in the ground, which meant that water at the northern end of the hall failed to drain away quickly. The water simply leeched into the longhall soil. And so the “Back Passage” was conceived. Work began on this towards the end of the year and the drain that ran along the north end of the hall was removed and redirected out towards the moat. 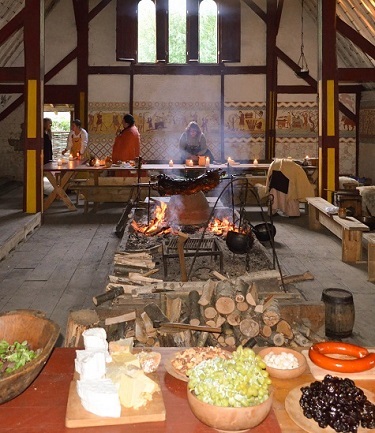 Design work on the forge began, and started life as a classical timber framed building, constructed in a similar manner to that of the longhall. Work would not start until we had the manpower to do so, which meant that the majority of the other projects had to be at least nominally completed. It was a hard decision to make, as it is our nature to leap into new projects, but it would have been to the detriment of the project as a whole if manpower was taken away from elsewhere on site. Having few options open to us, the spoil from the longhall floor excavation was deposited close by, inside the burgh on the other side of the roadway. This resulted in a raised area. To speed up its usefulness it was decided to turf it. And so in April we used the (now gone) pile of bark chippings that had been an ever-present resident outside our security gates as a substrate onto which we would lay the turf. 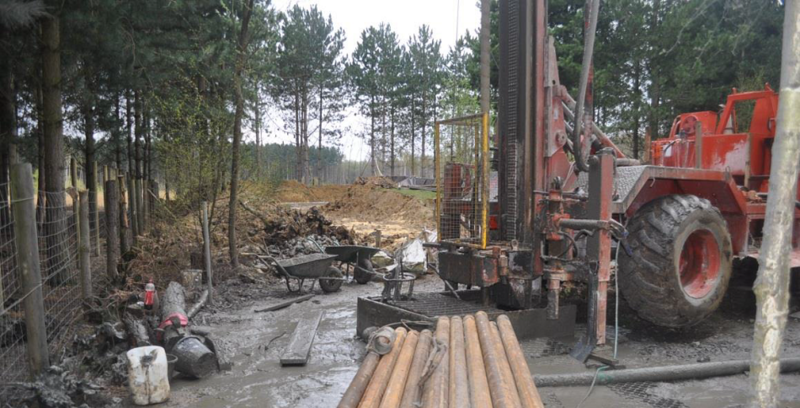 While the sponginess will reduce over time as it rots, it has proven to be successful and is, by its mere height, the best drained area on site! Carrying on from the previous year, work continued on the Back Passage with the foundation having been laid, and the uprights and floorway installed. With the 12th Night Feast quickly becoming popular, a solution was determined on how to economically battle the issue of furniture. And so a design was formulated which allowed us to utilise the scaffold planks which were still vast in number and furniture construction began in earnest. A large section of plaster on the south wall was showing significant wear and tear and caused a certain amount of concern. However, we were too busy to deal with the issue, so we hoped for the best and decided to deal with the problem when it arose. On a more positive note, the first fresco panel was completed and the plaster to the exterior of the longhall is painted. Second front door constructed. Silt traps. The Watchtower, an open-sided structure on one side of the main entranceway, was completed. 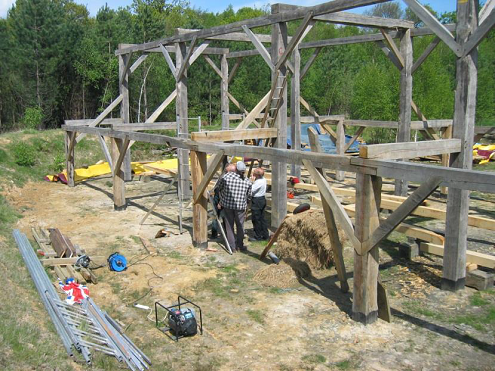 A complicated series of cross braced timbers was erected and after a last-minute design change, an impressive four-sided roof topped it all off. This year saw the arrival of an escapee from Wildwood – a Tawny Owl nicknamed Barry. Whilst a lovely bird to look at, it was poorly toilet trained, and created much work to clean up after him. After a failed attempt at making barred window frames, the modern solution of antibird netting was used. This proved successful. So while Barry still occasionally perches under the northern eaves of the longhall roof – there he stays, defecating and regurgitating to his (or her) heart’s content. The hall got its final lick of paint, with the loftier sections of woodwork being painted a pleasant shade of green. But, as though it was waiting for this significant moment to do it – the plaster panel at the southern end of the longhall decided to fall off. The front door went on this year! A bit of fettling was needed, as is usually the case with doors, but they work quite well in spite of having no door handles. These were being designed elsewhere! 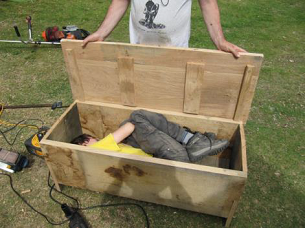 Finally, useful chests were made of wood bought during a show at Cranbourne Chase the previous year. Big enough to hide the various useful items that otherwise would be left lying around! 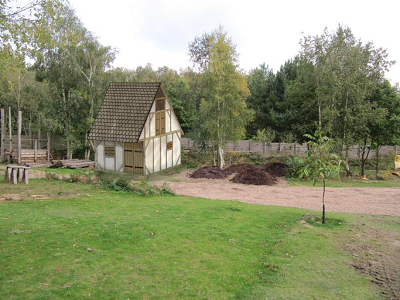 Finally this year, the proposal to change the design of the forge from a timber framed building to a “Stave Built” structure was taken on board. So, it was quite literally “back to the drawing board” and a new design drawn up and submitted to the rest of the society for comment. In fact two major milestones were achieved this year: the beginning of the construction of the Forge and the drilling of the borehole. We paid someone else to drill the borehole, however! 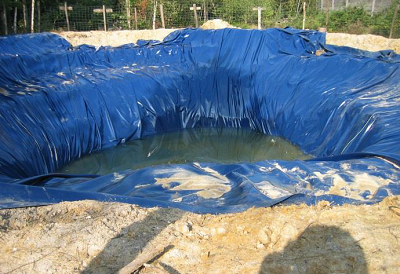 The Borehole was installed to facilitate independent and more frequent use of the site. After a delay caused by terrible wet and cold weather, it’s all done and works perfectly. All we need now are some toilet facilities and we’re good to go! Having painfully passed through the Planning Permission and Building Control process earlier in the year, the Forge construction began, with modifications made to the foundations and the delivery of freshly cut timber. 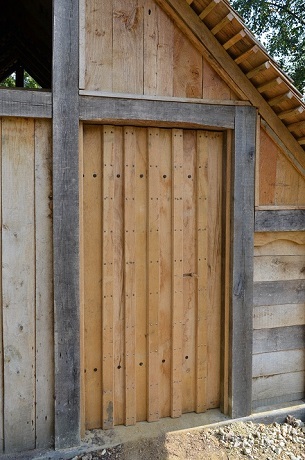 The forge is a thirty square metre footprint wooden structure built along the “Stave” building principle. When complete it will be a working blacksmith’s forge. This will hopefully breathe even more life into our little corner of Anglo-Saxon England when our members can come down and “have a play”. Bricking up and consolidating the drainage sumps – These were a modern solution to keeping the road dry during short periods of rainfall. Their success is directly proportional to the length of the rainfall, as they drain out into the moat. However when the moat is full, the site continues to flood in the same manner as before. However, by that time we generally have other more immediate problems to deal with, such as flooded tents and so on! 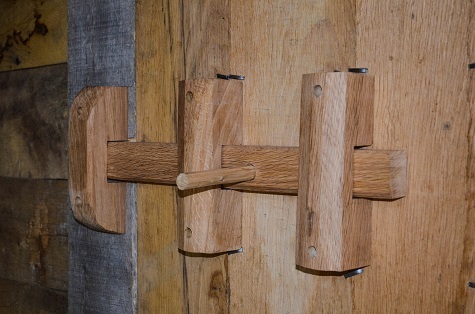 The door handles to the longhall were finally put on the front door – and mightily impressive they look too. The shipping container was relocated to a more discrete part of the site, freeing up much needed authentic space! The gates to the burgh were installed. After a protracted design discussion they were made in the traditional ledge and brace method, but with all the timber involved thicknessed down by 20 percent, to make them as light as possible, without them being weak. Not all work was new. Some resulted from a learning curve we had failed to navigate successfully. The end of the longhall was plastered in too large a section and stuck out beyond its wooden framework. Because of that, water got behind the panel, froze and the panel fell off! So, this year it was fully cleaned, partitioned and a new framework constructed, and finally in August, re-plastered. This time it should stick! In late July, in a new venture, a group of us spent an entire week on site plying our craft to the local scout groups that chanced upon us and the smattering of general public who were lured in through our gate. This culminated in one of two shows that took place at the site this year. Due to other events in the country, neither were particularly oversubscribed by Regia, but nevertheless we had a chilled and pleasant time. The sun shone and the public were appreciative as usual. All those who turned up had great fun, and while a shower in the scout hall was quite welcome, come the end of the experience, most wanted a repeat experience the following year. One of the projects for the Occupation Week was a large scale, authentically designed oven. Poor attendance hampered the start of this project, but the end of the August work week we had a solid foundation, a base and the framework made. There is just the walls to go up and a roof to put on. Work halted over winter and will hopefully resume in Easter. Nearer to the site entrance, away from any of the buildings, an area was identified and cleared for the second "Occupation" project – The Bloomery (for smelting iron ore). A lack of manpower prevented any further work from taking place for the moment, and it currently exists as a flattish area of ground in a clearing. Meanwhile, throughout the year, work continued on the Forge. 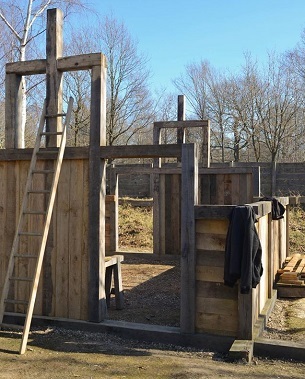 While the framework involved a large quantity of mortices and tenon joints and yards of channels being cut for the wall-planks, the walls shot up in no time at all. 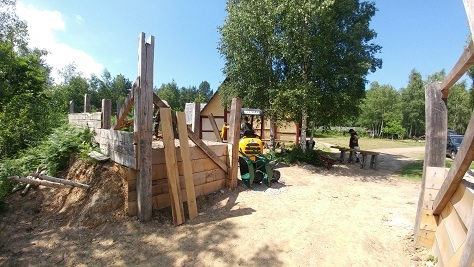 Since the first timbers saw “carpentry action”, a year has passed, and about 10 full days has been spent on building the structure. And by the end of the year, the project was about 50% complete. With a fair wind behind us, we should get all the planked walls up by March and the roof on by October 2015 (though timetables are an awfully dangerous thing to mention!). 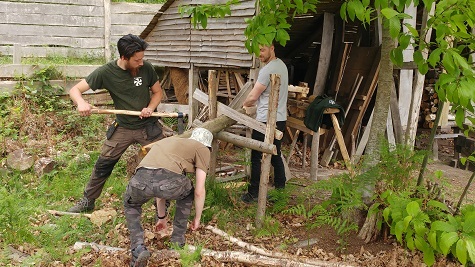 Finally, as work elsewhere on site drew to a close, sights were set on clearing the woodyard of all the rotten timber and to incorporate that area into the rest of the site. As well as being a neater, more manageable wood yard, it will be a battle practice area / archery range. Work started on this during the work week with the felling of a dozen pine trees and with the aid of the digger, piles of mulch that used to be pine logs were pushed into a small heap. 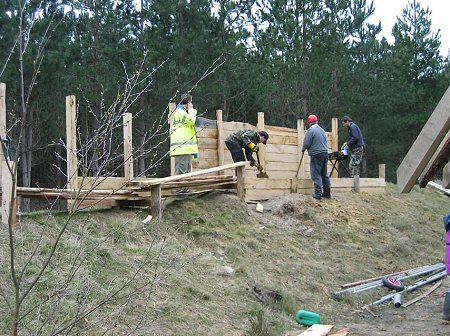 With the weather generally expected to be cold and wet, activities during January and February were concerned with two things; the clearance of an area of the site for future military training and the coppicing of trees in the nearby Blean woods. The area to be cleared is ultimately intended to be a battlefield/training area and an archery range. At the moment, however, it is full of the by-products of a decade of pine tree felling, as the land was cleared of its original inhabitants – and hastily constructed piles of “useful” wood. 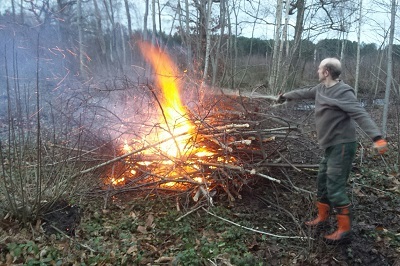 So, over the first two weekends, several huge pyres were built to dispose of the large quantities of the rotten pine logs – which were unpleasant to burn in comparison to the coppiced wood – as well as some of the bigger trees that were blocking off the area from the rest of the site. 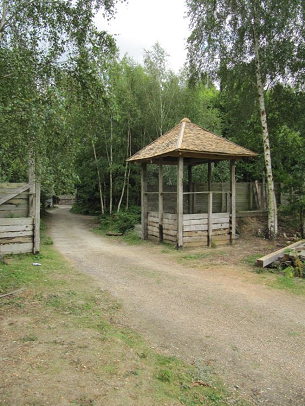 The coppicing arrangement with the Kent Wildlife Trust, who manage the woodland, has been hugely beneficial to us by providing not only quality firewood, but also construction material for small round – timbered structures. But during these first few weekends it provided	material for a new strand of activity for the weekends – that of bodging – which is the art of making products out of green (freshly felled) wood. In January the first product was made – a hurdle. Then in February, another hurdle, some chopping tables, and a stool or two were knocked together. And in March, a pole lathe! 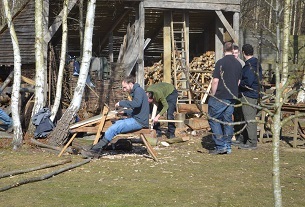 In March, sunny and comparatively warm weather meant we could restart work on the Forge. Though there were only three of us doing the cutting and measuring, we got the final wall up in a day – which gave us the time on Sunday, to do some checking, re-measuring and planning for the next weekend. In the longhall porch, another carving made its home just above the second front doors. And finally, over in the wood yard, more trees were felled, rotten wood was burned, and sodden wood was moved elsewhere and out of the way. And a few Ash tree saplings were planted to start replenishing the tree screen. Hopefully, by August, when we’re on site for a whole week, when it’s nice and dry, we can get the bulldozers in, and start levelling the area. So, with three productive work weekends under our belt, we could firm up plans for the rest of the year. 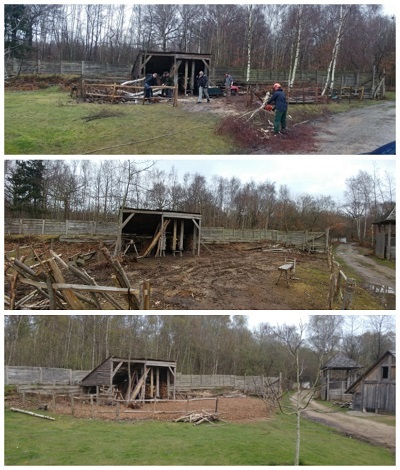 Expecting four days of better weather ahead of us and with the coppicing behind us, we could get well and truly stuck into the building of the forge and the continuation of the wall frescos in the longhall. In other words, Proper Work Weekend stuff! 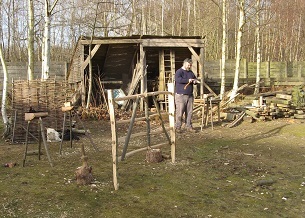 Outside the perimeter of the palisade, clearance of the wood yard still went on, with more tree clearance and burning. Among other essential maintenance, repairs to the shipping container roof were carried out, and in the longhall, pigments were mixed and designs were transferred onto the last few remaining bare (and very cold) walls. Like most of the jobs on the forge, the roof “flew” up. This was, in part, due to a reduction of the number of rafters needed (the original number was based on softwood parameters) but also because of the removal of the diagonal bracing element to the design. It was decided the 4” × 3” oak timbers were strong enough by themselves to cope with the weight of the battens and shingles. 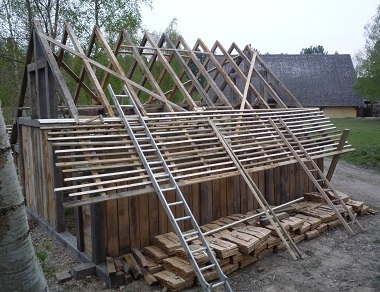 A good number of “treenails” (long dowels) were created by our tame bodgers to join the rafters together and stainless steel hex screws, which would be hidden, were used to screw the main timbers together and rafter sets to the building framework. 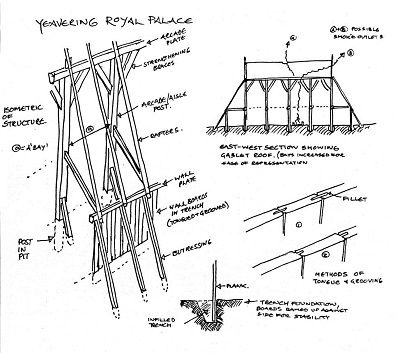 The building was left with sarking planks holding the pairs of rafters together and one diagonal bracing in place. Planned for the next weekend would be the remaining wind brace installed, the battens put up and after that, the shingles. For the past couple of years in May, a few carpenters have “roughed it” among the bushes and fend for themselves while pushing the forge project forwards. This time however, as well as the carpenters another handful of people had made separate arrangements to come down and do “other stuff” involving boats and their trailers. This year, two such weekends were arranged. The first job on Saturday morning was fitting the remaining rafter braces, which would tie them all together and make the roof one solid object. This simple act made what wobbles the frame had, disappear completely. It was reassuringly sound. 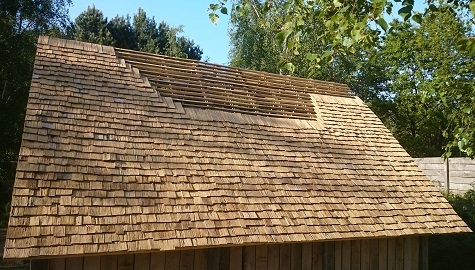 The next, significantly larger job was to rip down a load of pressure-treated planks to make the battens onto which the split oak shingles would be nailed. This element of the project comprised 36 rows of battens either side at 11.5cm apart. While that was quite a lot of battens, we had more than a lot of sarking boards to play with. We eventually ripped down about thirty boards. This precise distance of separation between battens was the height of exposed shingle – which amounted to about a third of its total length. 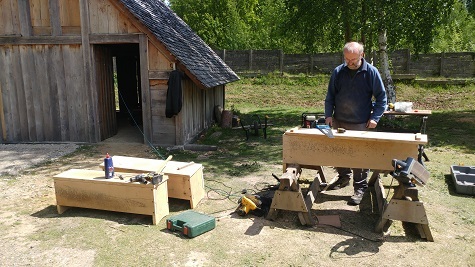 The pitch of the forge roof (45º) was shallower than that of the longhall (54º ± a couple of degrees), and while there are only a few leaks on that building, we didn’t have that luxury of such a steep elevation or the sarking boards, so we had to be more strict with the overlap. Time and rain will tell how successful we are. 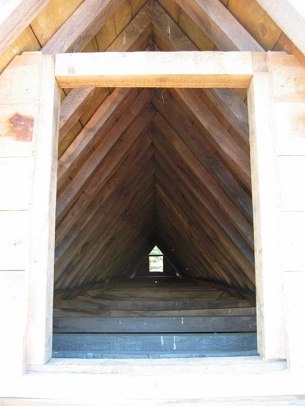 In the meantime, we would peer from inside the structure, looking for daylight between the shingles. Daylight = a gap = leaks. The few that weren’t involved in roofing were plugging the hex-screw bolt holes and sorting out a couple of the triangular infill sections which involved manufacturing yet more battens (this time out of oak and bevelled on the top side) which were nailed onto the main structure to create a frame, against which the triangular sections would be butted. By the end of Sunday we had time enough to slap a couple of shingles on one side of the roof, tidy the surrounding area up and admire our work. Like the previous weekend a fortnight before, for some of us it was to push the forge nearer to completion, for others it was a last mad rush to get the boats and their trailers ready for some much needed filmwork (filmwork = income). So, starting bright and early, we started to lay shingles on the battens. There were two significant differences between shingling this building to that of the longhall. We didn’t have to worry about left and right handed curves, making them fit and line up at the bottom and we lined the tops of the shingles with the top of the battens, instead of lining up the bottom. This didn’t have too much affect on the visual impact of the roof, but resulted in more of an overlap between shingles than there otherwise would have been and they laid better over each other. Subsequently it was a much quicker process. 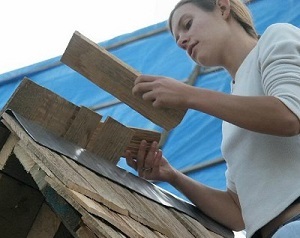 But, shingling is a very repetitive job and a constantly demanding one. You can’t just nail them next to each other. You have to pre-drill the shingle at the point it needs to be nailed to the batten and through the shingle beneath. That shingle not only needs to significantly overlap the ones underneath by two-thirds of its length but also to the ones left and right by no less than a centimetre (preferably more). And that was it for most of us, for the rest of the weekend. Pick up shingle, place shingle (if it’s the right size) on batten, pick up drill, drill hole, put down drill, pick up nail and hammer, nail shingle onto batten, put down hammer, and repeat for another six hours. 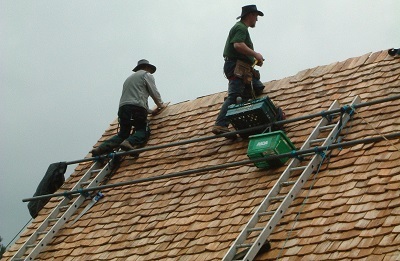 Some who were less agile provided much needed ground support, handing up shingles when required, or supporting the battens at either end, when they had shingles nailed onto them. Being the man in charge, I was fearful of running out of shingles, so I decided we would use the older shingles currently residing in the wood store. And judging by the number of packs we had left over at the end of this weekend, it was a good job we did. We certainly won’t have that many left over at the end! Between you and me, I won’t stop worrying until it’s all finished. 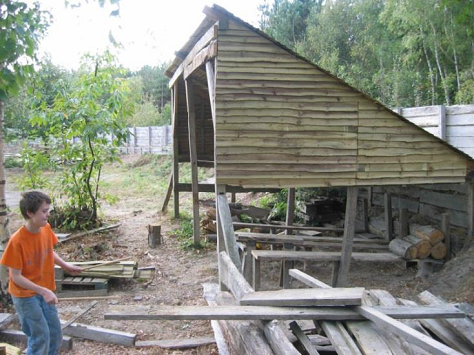 Manpower increased on occasion through the day, which allowed wood to be prepared for the front door, some of the triangular panels to be planked and filled and some of the main structural timber to be shaped to make them appear less “machined”. Roll on June and finishing the roof. Which all going well, shouldn’t take much more than a day. Famous last words, eh? It was a simple, straightforward weekend: burning, strimming and shingling were the three main occupations. And with fifteen or so of us on site we were able to carry out all the jobs with reasonable ease. As the Ragwort and Bracken had grown huge over the previous month, it was important to attack it before it became a liability. So, a couple of workers with a wheelbarrow and a rake followed the strimmers around, collecting and burning the waste. Another couple or four managed the pyre of rotten pine in the woodyard and managed to clear a reasonable portion of the area in a safe, controlled manner. It’s all on track for the groundwork in August. 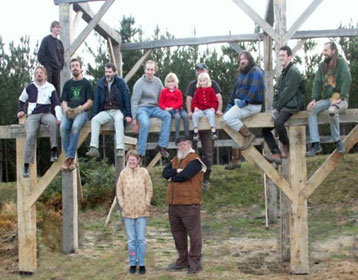 The remaining half dozen of us were perched up ladders, working on shingling the second half of the forge. Those that weren’t, were pre-drilling the shingles and passing them up. Fortunately, the weather was fine and we worked until seven o’clock Saturday evening, desperate as we were to get the job done that weekend. And finish we did, just before lunchtime on Sunday. 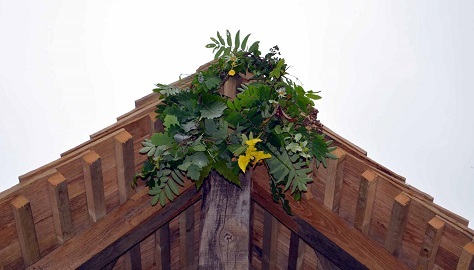 We had a small but perfectly formed topping out ceremony, where just after the final shingle was nailed, a wreath was draped under the eaves at the front of the building. It would be safe to say that we were all mightily pleased with ourselves. And rightly so. 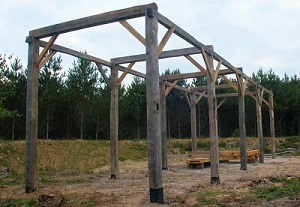 And so, two years to the month after the timber was delivered on site, the main structure of the forge is now complete. Now, gaps need to be filled, shutters and doors need to be made and hung, the floor needs to be filed in, bellows made and the raised forge hearth needs to be constructed, so we can actually use the thing. Alas! Your browser does not support this video. Alas! Your browser does not support this video either! In August, as usual, we were there for a whole week, so this gave us the time to do larger scale activities. With July’s work weekend skipped due to people being elsewhere, we had a lot of catching up to do to bring the site’s flora back under control. It had been a warm and wet few weeks since June and everything had grown to stupid proportions. Even the rabbits couldn’t keep up with all the grass that was on site. So strimming, hacking, pruning and mowing were among the first tasks that needed doing. From the perspective of scale, landscaping the wood yard was one of the biggest jobs of the week. All the burning of the pine during the past year had been leading up to this moment. One of the big hurdles though, was the processing of the large logs donated by the Dover Boat project a couple of years ago. Placed in the middle of the yard, it had to be cut into useful, or at the very least manageable chunks so it could be moved elsewhere. Technical issues meant that this w’sn't quite achieved, with only a few large chunks left to saw. Once all the mouldy, rotten, twisted and warped planks were sorted into a “charcoal” pile, very little decent actual wood remained. 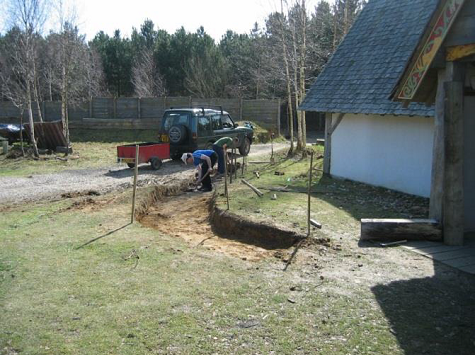 A digger and dumper was used to move and level earth and dig up the birch tree stumps that had recently been felled. Wet weather and a confusion over the actually ordering of the plant curtailed some of this activity, but we managed to roughly grade the area by the end of the week. A couple of months of settling and some good weather should allow us to reassess things and fine tune the area. And then in March or Spring 2016, hopefully we can seed it with grass. While the forge’s framework and roof was complete, there was still a lot to do to make it weathertight. 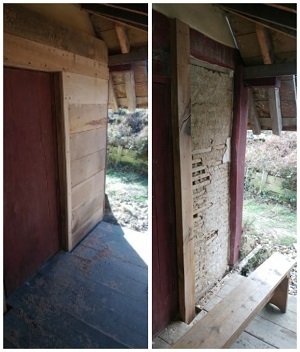 We filled the upper wall sections with planks, raised the floor to the level of the threshold and partially constructed a door. 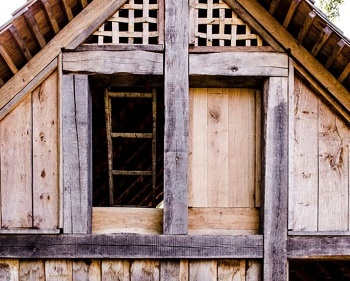 Additionally, a woven infil was placed in the top of the gable ends, to prevent large birds from settling inside. There shal be no more Owlish interlopers! All things being equal, there is every chance of the back door going on by the end of the year. It was decided that we would eschew authenticity for the floor, and simply fill it with type 1 – the sort of stuff for making pathways. All other options were too expensive, and we would have ended up looking the same after a few year’s use. Eight ton bags were hand shovelled into (and in front of) the building and whacked down with a whacker plate – which sadly wasn’t as fun as it was thought to be. And, barring a small section of crumbling wall, off in a corner, and after many years of diligent work, the longhall fresco was finally completed. Scattered throughout each wall are amusing nods to classical and not-so-classical literature. Elsewhere, are society in-jokes and references that would need explaining to the average Regia member, or swiftly glossed over when described to the members of public. One of the smaller tasks that was carried out, was lifting some floorboards to see what was underneath. And it turned out to be a big problem, as we found rot. Whether it was “arrested” or ongoing, we don’t know, as none of us were professionals in such an area. So a new job has been added to the work schedule; that of replacing the joist of the rotten section. These things happen. September’s work weekend has been taken over by a social occasion, so work will take a back seat until the two October work weekends. Then that will be it for another year. It certainly sounds like there’s a lot to squeeze in to those two weekends. While work took a back seat, as feast preparation and some unexpected filmwork was taking place, a small amount of work did take place. A few more planks from the Dover boat wood were sawn off. This was awkward even with the use of the digger to persuade the large logs into place. This time, the difficult level escalated to very tricky! 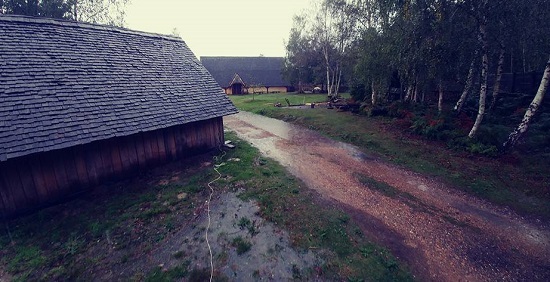 As there had been a recent downpour, footage was taken to see where the low points in the wood yard were. Dry weather is necessary to be able to do anything about it. So, this part of the job won’t really be able to be finished until Easter 2016. Back in the forge, work started on making the Y-piece for the bellows out of a fortuitously discovered section of tree, and some of the bolts and nails were riveted and nailed to the front door. Apart from the money, the only real benefit of filmwork, is that the site is nicely tidied up in advance of the final two weekends of the year. Due to the shortening days, there were two work weekends. Fortunately the weather was glorious and output equally good. The primary job was dealing with the rotten joists in the longhall floor, so it was an early start on Saturday pulling up the floorboards followed by, and occasionally accompanied by the rotten joists they were sitting on. 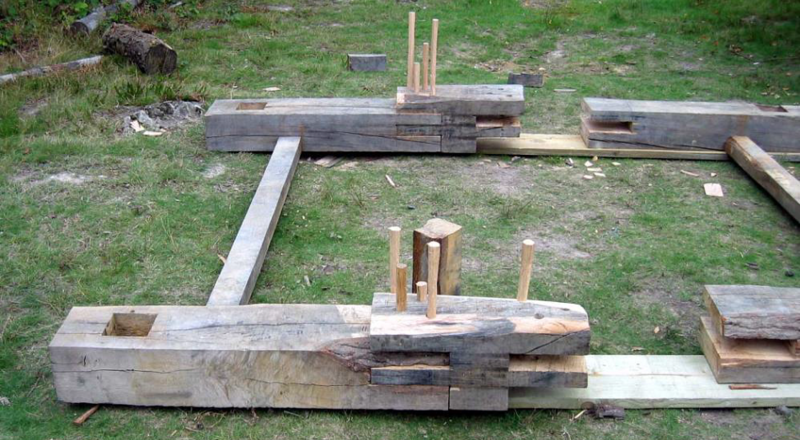 The joists were burned and the boards, numbered, de-nailed and laid outside, in their location, on the grass. The edges were replaced with hardwood, and the cut-price semi treated joists were replaced with “proper” joists. So they should last quite a while, this time. But this was only a fifth of the boards – and not all of them will need replacing. We wont know until the boards are lifted. On a slightly less destructive note – in the forge, the front door was completed, a wooden draw bolt added to keep it shut and wood was prepared for the back door. On the second work weekend, there was just enough time to roughly construct the rear door an wedge it into place, carry out a good amount of grounds clearance up by the longhall, clear out and tidy up the shipping container and a few other minor repairs. And so, the site was put to bed looking a lot more complete and tidier than the year before. We had just the right number of people over the weekend helping to produce another huge stack of firewood which, amongst other uses, will help keep us warm during the nights. We were blessed with decent weather during the day – the “real” rain saving itself for when we were in the longhall during the evening. Fatigue and time limitations meant we didn’t coppice on Sunday, but merely carted away the stacked timber from Saturday. I don’t think we’ll need to coppice again this year, but our options are open up until March. It seemed like an age since the last work weekend, and a somewhat bitter-sweet return to the site for my last stint as Coordinator. It was nice to see the forge intact, and its roof appearing to have done its job. The site was tidy looking and, standing water aside (and willies donned), quite pleasant to wander around to check up on the familiar surroundings. But while it was sad to see our recently departed Kim’s chair lying unused against the aisle post, and his brolly secreted in the back passage, I don’t think he’d want us to dwell too much on his absence, but to enjoy the hall as he did, and to continue to make Wychurst the flagship of our society. Such is the nature of work weekends, is that sometimes outside forces effect a complete rethink on what you had intended to do. Amongst other smaller jobs, I had intended to finish relocating the last amount of spoil from the facilities compound and thereby step one pace nearer to be able to lay foundations for the building. I had also hoped that further work could be done to finish the forge, as it still only has one fully fitted doors, and no shutters. However, earlier that month, an inconclusive site visit from the BBC compelled us to reprioritise, and fell eight or so large pine trees on the perimeter of the site – to allow for some dry-dock maritime filming – or in plain English “pretending to be on a boat when you’re not”. These were Big Trees, and had been on our land since well before we took ownership of it. So it would require everyone to lend a hand to shift the bits of dismembered, resinous weed, and burn them. There were only eight of us in total and two were there just for a day. As a result it was knackering. It was also, not the best of weather to be felling trees, as Storm Imogen was gracing us with its presence. However, it was dry and occasionally sunny. So, by late Sunday morning, we all survived the process, and managed to have enough energy to discuss plans for the boatyard and the surrounding area. All of which should occupy us for a good year or so. The Easter long work weekend, in late March, is a rather long time away, so filmwork notwithstanding, we have plenty of time to get our ducks in a row. Well, the filming came and went, fake blood was splattered on the longhall floor (grrr!) and they used up most of our firewood – which we charged for. But sanity resumed a week or so later with more work on site! The four days at Easter means we can prioritise the larger scale and more complicated jobs. 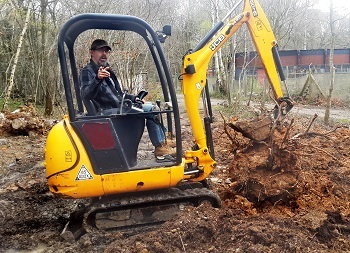 So we hired plant in the form of a digger and dumper, and further landscaped the woodyard into a more level battlefield and enhanced the earthwork archery range. Also, we managed to free up more space for the planned facilities building. We also used the digger to help remove some of the recently felled tree stumps in the memorial stone area. Hard, muddy work. Up by the longhall, the bread oven project, which had remained a dormant for a while, burst into life and was completed within the last three days. Some slow drying, coupled with the construction of a protective shelter should keep it in good nick for some years. 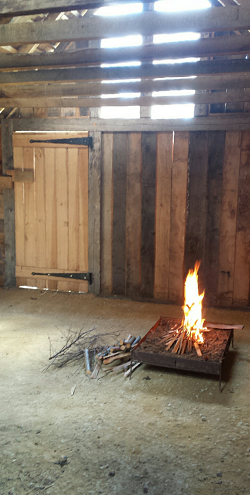 Work on the forge was modest, but the back door was fixed on its hinges – and now just needs a door latch installed. As is usual with this time of year, manpower was dispersed widely across the site. So elsewhere an extension to the Battlefield “prop” Palisade was completed and still more vital work (and tree-felling related repairs) was carried out on the boats. The site escaped the majority of Storm Katie’s weather, but the heavy rain caused a few issues with some of the earthworks – so that element wasn’t quite completed. All in all, a none-to-shabby work weekend. April was not quite a full weekend as the site was invaded by a film company on the Sunday. However, we made the most of it. A digger and dumper were hired to remove the last of the tree stumps in what will be an area destined to receive a memorial cross to our dearly departed Eolder. It was a tricky business due to the saturated ground, combined with the size of the Corsican pine stumps themselves. 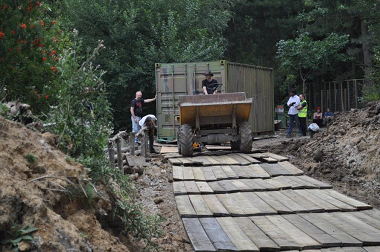 But they were forcibly evicted by lunchtime, allowing us to “make good” the area over the next two days. I wouldn’t say you couldn’t tell we were there, but it doesn’t look too shoddy. Next month it’ll have topsoil and turf added. Having served it's purpose there, the dumper was then used to transfer vast quantities of foliage resulting from a palisade tree-prune that occurred Saturday afternoon. Meanwhile, in the Forge, work started on making the front shutters and filling in a few tell-tale holes that allowed modern fixing devices. A bit of carpentry happened on the rear door frame and the building was thoroughly cleared out in preparation for the filmwork. We are slowly coming to the end of all the little jobs for this building, so we should soon be able to start work on the blacksmiths hearth. Then, it’ll be time to hit some hot metal! May, however, seems such a long way away. Whilst understandably quiet on the Friday, and just plain quiet on Sunday – we had a good sized team on Saturday when it mattered. May saw the final weekend of the memorial area preparations. A few of us came along on Friday to get the job done – which we did. Shovelling and raking 5 tonnes of topsoil and the laying of 100m2 of turf was quite therapeutic in a perverse sort of way. On Saturday, as we had a plenty of leftover turf and the available manpower, we did the last little bit of the area. It looks so much the better because of it! In the scant hours remaining between turf laying, tree burning, mowing, strimming and being filmed for the shed of the year entry (I kid you not! 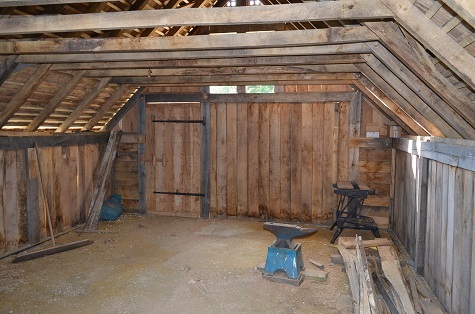 ), a shutter for the forge was made, a rear latch was installed, and some of the wood was prepared for the hearth. We’ve no pintles yet, so it’ll have to wait until June to be installed. And so, in June, we will be able to give our full attention to the project once again. There are some deadlines fast approaching, so I shall pray for sunshine and mass enthusiasm from the society. In June, we did indeed return to the project, although the focus was on the remedial side rather than making anything new. Back in October we started to replace the rotten floorboards in the hall. 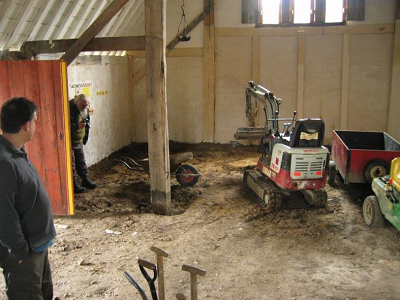 This was caused by a mixture of mis-conceived cost saving measures and unexpected geophysical activity – that is, we used the wrong sort of timber for the joists and the earth slumped onto the joists from beneath the cill beams. So, armed with a motivated bunch of lads, a huge portion of the floorboards were prised up, numbered and relocated outside. The joists were then assessed and replaced with “proper” joists and the floorboards replaced – approximately in the same place and order. 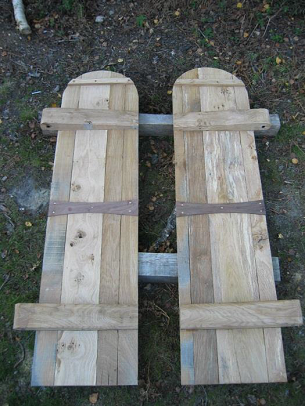 Where they touched damp earth, a few boards were rotten, but on the whole they seemed fine. We only lost half a dozen or so, during the lifting process. Hopefully, with enough people, we can get the majority, if not the remainder done during the August work week. Elsewhere, a couple of hinges were made for the forge shutters, and essential grounds maintenance was carried out. There’ll be a fair bit of grass strimming needed in July to get the site fit for the festivities in August, but as usual, exactly how much gets done, depends on turnout. Throughout the hot and humid weekend, grounds maintenance continued, with more mowing, strimming, raking, metal dumping, tree felling and a modicum of incineration of the resultant brash and logs. The principle being: the more work done this weekend, the sooner we can all focus on doing and making things during the work week, rather than new visitors being drafted into tidying up the place. Over in the forge there was fettling, dowelling, trimming and adjusting. All those interminable small jobs that comprise the functional parts of the building. The results of their weekend’s labour was a working shutter and a blocked off window (that can be adapted to a shutter, if need be, later on). Also, a LOT of temporary screws were either replaced with sturdy nails or dowelled. It was one of those peculiar weekends where a lot of work took place, but aside from the missing trees, relatively little to show for it. If we thought July was hot, we were to be seriously mistaken. August proved to be the hottest work week ever, with temperatures hovering around 36°C. So, it was fortuitous that the week was shorter than usual, and the tasks a bit thinner on the ground, as by the time early afternoon came around, it was too hot to be doing anything involving any kind of exertion. But happily, things were ticked off the to-do list. All the boats in the boat yard were moved to a more efficient location, providing not only much needed car parking spaces, but also access to the facilities yard when we buy in the facilities building. The split ship was finally separated – with one half being moored alongside the fire lake, and the other to make a permanent boat burial display. The beginnings of a dedicated footpath to the facilities compound was laid. Masses of ground clearance took place, nicely tidying up the place, readying it for winter. 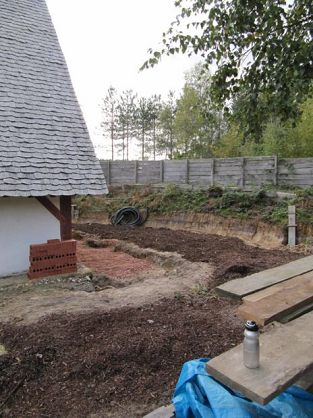 More earth was moved, to form a bank to hide the boat yard and improve the profile of the archery bund. 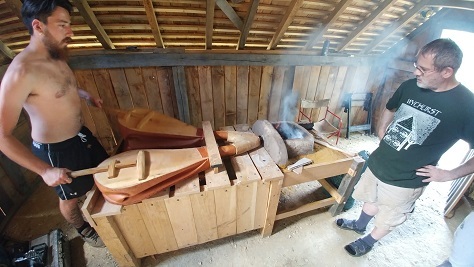 Nearly all the ancillary fittings to the forge were installed, allowing work to start on constructing the actual hearth itself. The bread oven was finished with the external cracks being filled, and an “authentic” pizza being baked! All it now needs is a shelter built over it, to protect it from the elements. Wednesday was the last day of the work week, and was dedicated to the preparation of the site for the evening feast and erection of the commemorative cross for our recently departed Eolder – Kim Siddorn. Over a hundred people fed themselves to the point of exhaustion inside and outside the longhall (for it was still ridiculously hot and humid). It was a fitting celebration for a man who considered Wychurst his home from home, and I think he would have approved of the casual deforestation of the memorial area to allow room for the cross commissioned in his name. Thursday was the big departure and tidy up, with people leaving for home and for re-camping at Detling, for the Bank Holiday three day multi-period re-enactment event. And finally, on Friday, friends and relatives of Kim, were welcomed and shown around the site, and with another ceremony, the cross was revealed to a new audience. It was a hot, sweaty and tiring week, and from a personal PoV, not best followed by a three-day show – but it was very satisfying and being surrounded by a group of friends who share the same passion for the project, makes up for the aching limbs and lack of sleep. September’s work weekend was sparsely attended, but good progress was made by tearing out the rear gateway – which was hastily put together a few years ago, and inserting some larger, more appropriate timber. Energy levels dipped early – plus activity was hampered by torrential rain. So the bracing and revetting will have to wait until the next month. Contentedly under cover, over in the forge, good work was made on the hearth, and is now half-complete. Absence of dowels, pegs and glue necessitated the temporary construction with screws. So these will have to come out before too much work continues. Elsewhere, a pole lathe that was half-completed the previous year, was revisited, and made working. It wasn’t the most beautiful pole lathe in history, but it worked. It now just needs “refining”. With the days getting shorter, and the weather more inclement, sites are set closer to home, and large scale earthworks take a back seat. But ultimately, progress is governed by the numbers that turn up, and (cough) their degrees of decrepitude! October was a moist and muddy affair, and definitely not best suited to the tasks at hand. However, the few hardy souls that turned up made notable progress on the rear fighting platform, where a couple of bracing joints were created, and in the forge, where the hearth neared completion. 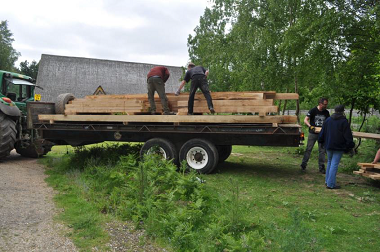 Wood for the gates were located and work started on removing the top two planks of the boat burial ship. As expected, and was usual in November, output reduced commensurately with the limited daylight. That said, the dozen or so that turned up put the covers back on the remaining boats and installed the last fixtures to the forge. Just a few little things to do on the hearth itself, and it's ready to roll. Pulleys to raise and lower the sconces were installed in the longhall. Loads of firewood was chopped and stacked ready for 12th night and some saplings were planted around the perimeter of the site. A few more sockets in the fighting platform posts were chiselled out and all the remaining brash was burned. Less strenuous was the finalising of the plan of attack for sorting out the facilities yard foundations and Saturday night was rounded off with a stonking beef in port stew and some spectacular fireworks. It was a curve-ball year, what with the loss of Kim and specifically for Wychurst, the resultant prep-work for the memorial area. So “The Plan” took a back seat, and suddenly, after a flurry of organising, we had a deadline to work to and priorities shifted. But it all went more or less to plan. If 2017 goes to plan, we’ll have all the current projects completed, toilets on site and twice as much storage as before. And in 2018 then, perhaps, we can start the next building. As regular as things can possibly get, January arrived and cruelly reminded us of our excesses during the festive period. And so, this weekend we came down to harvest both more firewood and constructional timber, and in the evening, complete a year’s commemoration of our Eolder’s passing with the planting of a Medlar Tree and have a slap-up 12th night feast. It was persistently drizzling throughout the day; and barring a truculent tractor and a deflated tyre, a good half dozen or so loads of timber was taken from the nearby wood. The accompanying photo displays our firewood reserve in all its glory! The numbers doubled to around 40 in the evening, as the less hardy souls arrived for the 12th night feast, hosted and planned by yours truly, and aided by a few kind souls. In the end, all the hard work by the workers, chefs and helpers paid off, and we all went home satisfied that the work went smoothly and everyone had at least a bit of what they fancied in the evening. Next month, it’ll (sort of) be more of the same. But we’ll be focussing on inside the burgh as well as outside. With only the hardiest of souls brave enough to face the dreary February weather, we didn’t coppice. Instead, our focus was to clear a number of trees from various inconvenient locations inside the burgh. Each year, without fail, saplings and bracken rise up and, if a month goes by without attention, the surroundings gain a certain jungle-esque quality. Deforestation and scraping everything flat will allow us to landscape the areas to a smoother, more accessible shape – and maintenance will be a lot less of a chore and more a gentle perambulation with a lawnmower! And so, around each tree a ditch was dug, roots were severed with mattocks and axes, and like the Orcs from Saruman’s tower, we pulled them down in a (generally) controlled manner. A dozen or so trees were toppled over in this manner, and the results brought a sense of space to various parts of the site. Despite the failure of a critical piece of machinery, we managed to clear a long neglected section of our land that had been earmarked for the entrance between our site and that of Wildwood Nature Park. The previous entrance was never ideal, as it led the public between security gates, and often a portaloo. Not the most glamorous first impression! Unfortunately, work in the facilities area came to an abrupt halt due to the breakdown of the digger, only going so far as to dig a basic drainage channel through one of the banks of earth, and removing an inconvenient tree. Much was learned in the process, however, and probably saved us from an unfortunate event later on. Two steps forward, one step back, as they say. Elsewhen, the final meeting with Wildwood occurred that paved the way for three events to happen on site. Two small events in April and October, hosted by two local Regia Anglorum groups, and a larger, society wide event at the end of July. There’s lots to sort out in the meantime, and by the time the next work weekend comes around, our toes will have metaphorically been dipped in the water, and regular use of the site comes ever closer to becoming reality. With just over twenty people on site at one point, masses got done over the long Easter weekend. 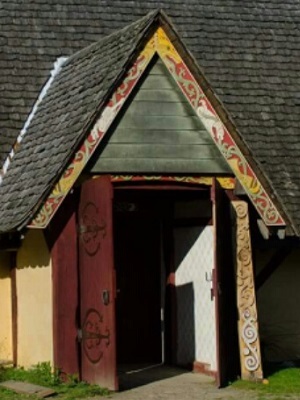 The final carving was fixed to the longhall's porch (see Pic). The Forge hearth had the last of the woodwork completed. Shuttering work and drainage channels were dug for the facilities area. The shave horse became operational. More useful chests were made. The eternal process of grounds maintenance continued. Hinges were fixed to the existing chests in the longhall and a new camping area was "discovered". 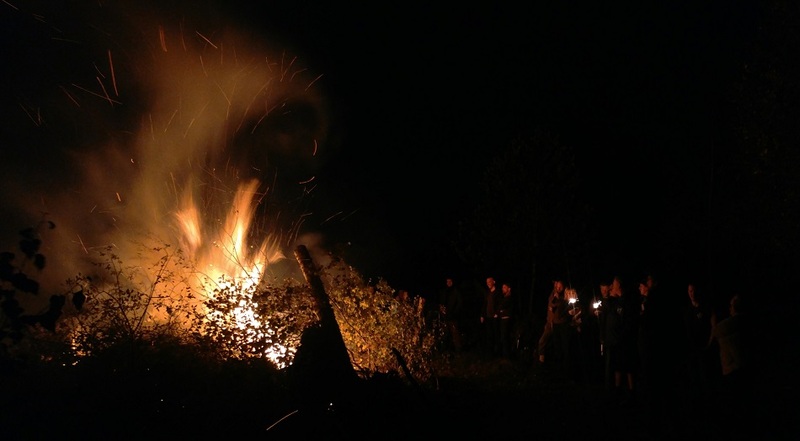 We were blessed with gorgeous weather (which always motivates people) and had a stupendous bonfire on Friday night. A weekend worthy of self-congratulation! May saw the rear gateway continue its journey to reconstruction, under the energetic attention of one of our local groups. The gates themselves were temporarily constructed in lieu of having the appropriate nails to hand, but handrails were installed and the beginnings of a second set of steps were started. 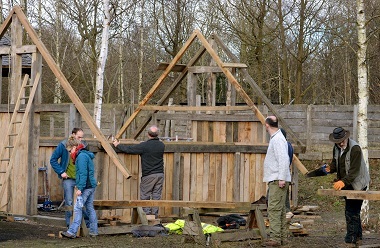 With work drawing to a halt on the gateway, due to the absence of hinges, nails and a digger, on Sunday the same youthful gang started on installing a fence around the wood store, as it will be used to display wood workings, and thus the public ought to be protected from rogue bits of woods, axes and the like. 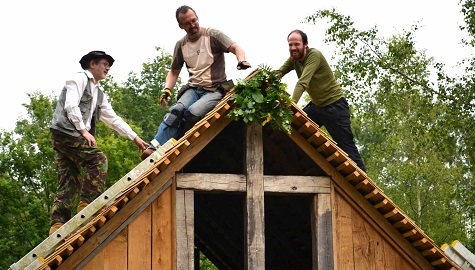 Elsewhere, as well as much lawn mowing and tidying up of the longhall, another local group’s cottage slowly gained rafters for its roof, and more chests for the longhall were made. During the searing summer heat, we dealt with the ridiculous amount of weed growth that had happened since May. We prepared the facilities area for some contractors to do some work on – which involved clearing the area, and emptying, lifting and relocating the pump shed - which was a lot heavy than we thought it would be! We also made a good progress on the rear fighting platform and... we finally got the forge hearth working! With a new gate between Wildwood and Wychurst, July saw a return to our annual shows on site. 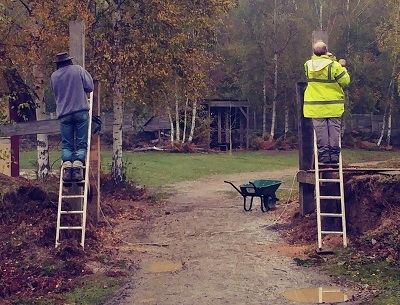 Canvas of varying shades of brown dotted the site, sheltering our keen re-enactors. They were resplendant with period crafts, warriors at rest and other interesting trinkets with which to engage with and explain to the general public. Alas, as most of us were in kit, there is little photographic evidence of our activities, so you'll just have to keep an eye on the Wildwood website (or even better, our own) to find out when we're open next. August saw a change from the usual activities, with a week of crafts on site. 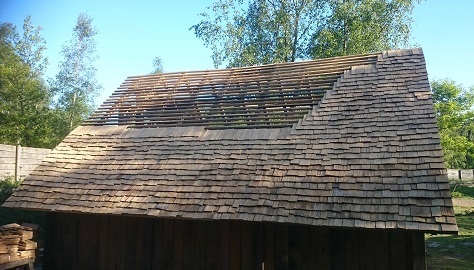 In spite of this focus on crafting, the longhall roof had a few repairs made to it, and a fence was built from riven timber (wood split with axes and wedges, then trimmed) which now surrounds what has now been designated the woodworking area. 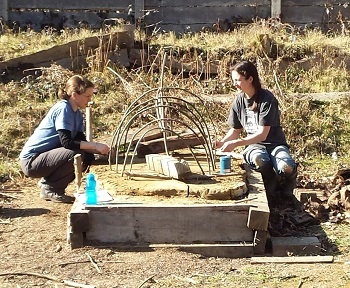 Meanwhile, baskets were woven, pots were fired, food baked in the kiln, pigments ground and turned into paint, and work started on the bread oven shelter. In September our sights were narrowed and focussed due to the low turnout, but we got loads done. 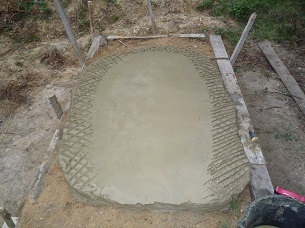 Most of the foundations for the archery mound retaining wall were poured. 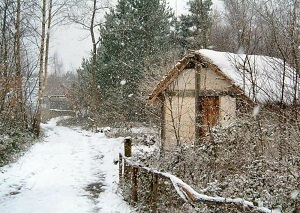 The wood shed was re-filled with our coppiced wood. The pond perimeter was tidied up and the area by the moat hacked back to allow visitors to actually see the longhall from the new entrance from Wildwood. We'll wait until November before dealing with the roots, in case we make a mess. Finally, much grass was also cut so the site will be just perfect for our show at the end of October. And so November came around again, the working days were shorter and the weather less predictable, but still we came to develop our site. With a surfeit of manual labour, and surprisingly good weather, we set to clear the area around the moat, to dig out the stumps left after the previous work weekend’s felling, and to continue building the archery mound retaining wall. The long evening was spent around the fire plotting in a good way, rather than gunpowder, treason or plot variety – and the way forward into 2018 and beyond has been populated with ideas that could see many of us watching their creation from the comfort of an easy-chair. The winter months are traditionally set aside for feasting, tidying up the site and grounds maintenance, as it gives us the rest of the year to lose weight and for the ground to recover! This year, inconveniently placed trees were removed from the woodworking area by the wood store and all the slowly rotting wood was relocated elsewhere - some would be burned, some turned into charcoal. Also, some more space was made near the entrance from Wildwood. The weather was rarely in our favour, as it barely stopped raining. Pines were felled over near where the facilities building will be located - to deter needle drop on its roof and allow more light into that dark corner. The forge got a tidy up and a few useful pegs were inserted into the wall, to allow tools to be hung within reach. Finally, the side door to the Longhall received some necessary repair and reinforcement, as the reverberation of the door slamming, had shook the plaster loose. 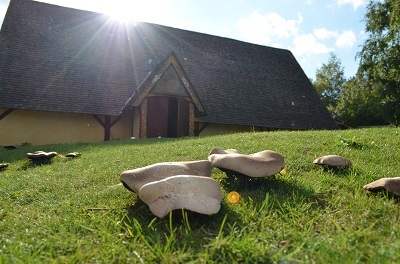 Spring certainly sprung with a vengeance, as the sun made a welcome return to the site. With both hands, we seized the opportunity to burn all the rubbish that had gathered since the beginning of the year, shovelling the remainder of the shingle beneath the boat burial half-ship and finishing the retaining wall for the archery mound. 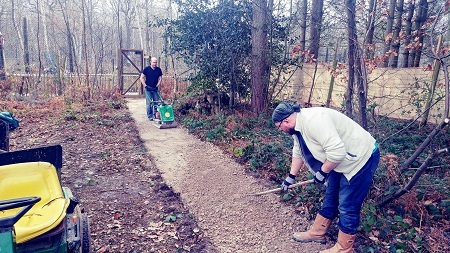 On the Sunday, we laid bark chippings on the still swamp-like area that the woodworking area had become since tearing out the tress stumps just four weeks previously. In a few years it’ll probably grass over, as the bark chippings rot down and turn into mulch. Sometimes, work at Wychurst isn’t of the most glamorous kind. Notwithstanding the perennial movement of wood from one part of the site to another, the tidying up of debris from previous jobs and cutting the ever-growing grass and weeds, we sometimes have to grit our teeth and address the fundamental issues of on-site amenities. So, after a good deal of preparation and resubmitted proposals to the local planning authority, and nearly twenty years of “making do”, we started work on toilets and a workshop. What is effectively a glorified shed, it will hold the barest of essentials and the most fundamental of tools to allow work to take place. Having learned the hard way that the lifespan of communal tools can be measured in the weeks rather than years, nowadays we tend to bring our own. Starting in August, eleven days later, we pretty much finished the larger (workshop) section. There are a few basic additions to the rear of the building that will prevent the immediate start of the second half of the structure, but by the end of the following year’s work week, we should be in a position to flush a toilet in anger!